Each piece of bridal jewelry from Gabriel & Co. is distinct in its beauty, style and elegance. Exquisitely crafted, they are an expression of romance, passion and personal style. Every engagement setting, engagement ring and wedding band celebrates love, commitment and all the joy associated with the joining of your lives together. Let Gabriel & Co. put you on the path to your new adventure with a piece of jewelry that is all the things you are looking for: enchanting, sensuous and exhilarating! And be sure to have fun with the process of selecting these special pieces of jewelry for the one you love. + What is it that sets Gabriel & Co. engagement rings and wedding bands apart? - What is it that sets Gabriel & Co. engagement rings and wedding bands apart? Gabriel & Co. rings are among the finest in the world! Each elegant and beautiful piece is hand-crafted with careful attention to detail and styling. They are designed and manufactured with impeccable artistry. The timeless pieces encompass classic, fashion-forward jewelry that make a lasting impression as you are making memories; both of which will last a lifetime. + Where can I shop for a Gabriel & Co. engagement ring? 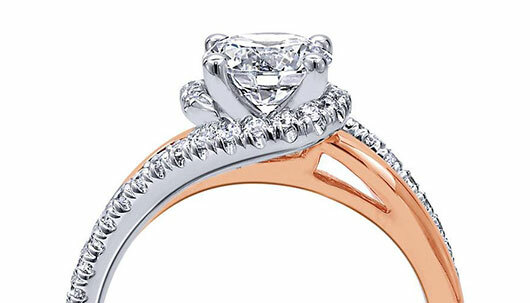 - Where can I shop for a Gabriel & Co. engagement ring? Get to know Gabriel & Co. jewelry at an experienced, family-owned-and-operated retailer with unparalleled expertise in bridal jewelry. They are passionate about helping you find the best choice, whether that is choosing a ring from one of Gabriel & Co.’s many collections, or designing a custom piece. + Will Gabriel & Co. customize an engagement ring? - Will Gabriel & Co. customize an engagement ring? The ring you want, whether it is in the showcase at a retail partner or in your mind’s eye, can be created with your choice of head, style, stone or color combination. Just show the jeweler photos and/or sketches of rings that you like, and tell them what you like about it. It will also be helpful to know her ring size, the metal you desire, center stone shape and size, as well as the budget you’d like to keep within. + Is the center stone included in Gabriel & Co. settings? Does the designer offer complete rings? - Is the center stone included in Gabriel & Co. settings? Does the designer offer complete rings? Gabriel & Co. offers semi-mount engagement settings, meaning that smaller accent gemstones are set, but the center diamond is not, and would be an additional charge. Your authorized retailer can assist you with purchasing a center diamond for your Gabriel & Co. engagement mounting. There are also complete engagement rings available, with center stones set in mountings, which are ready-to-give. There are benefits to either scenario: a semi-mount leaves you with options for creating the ring of your dreams, choosing the shape and size of your center stone; with a ready-to-give piece, what you see is what she will get! + Are the diamonds used by Gabriel & Co. in their engagement mountings conflict-free? - Are the diamonds used by Gabriel & Co. in their engagement mountings conflict-free? Gabriel & Co. has long-supported clear, accurate and unambiguous disclosure of natural mined diamonds. They have chosen to use only natural diamonds that can be verified through their stringent sourcing and tracking processes. Each of the diamonds sold in jewelry settings is in full compliance with the certification system of the Kimberley Process, as defined by the United Nations. + Do I have a choice of precious metal for my Gabriel & Co. bridal jewelry? - Do I have a choice of precious metal for my Gabriel & Co. bridal jewelry? You may select from platinum, yellow gold, white gold, or two-tone gold. Platinum is durable and resistant to most damage. It can scratch but will not chip. It will maintain its color and brilliance, without the need for plating. Gold is an enduring metal with a natural beauty. Be sure that your piece is karat stamped. + What center stone shapes may be featured in Gabriel & Co. engagement? - What center stone shapes may be featured in Gabriel & Co. engagement? Gabriel & Co. engagement may have baguette, cushion cut, emerald cut, marquise, oval, pear shape, princess cut or radiant center diamonds. + What weight center stones are accepted in Gabriel & Co. engagement settings? - What weight center stones are accepted in Gabriel & Co. engagement settings? You can find Gabriel & Co. engagement settings that accommodate diamonds that are less than a carat up to five carats. + How much do Gabriel & Co. engagement mountings cost? - How much do Gabriel & Co. engagement mountings cost? Gabriel & Co. engagement settings are available at J.R. Dunn Jewelers from $925 to $4,025. + Are there Gabriel & Co. wedding bands to match the brand’s engagement rings? - Are there Gabriel & Co. wedding bands to match the brand’s engagement rings? Diamond bands include ring jackets, eternity bands, curved and straight styles. + What is the warranty offered by Gabriel & Co.? - What is the warranty offered by Gabriel & Co.? Gabriel & Co. will make any necessary repairs or replacements that prove to have manufacturing defects. The firm offers an extended warranty protection past their regular guarantee, that includes coverage of damages and repair to jewelry due to normal wear and tear or accidental damage from one year from the date of purchase. This warranty is only valid if merchandise is registered by its unique Gabriel Serial Number within 30 days of purchase. Detailed terms and conditions are available online. You should keep your original sales receipt and ensure that the requested, and ensure that the requested information is filled out online. + What is she doesn’t like the engagement ring I selected? - What is she doesn’t like the engagement ring I selected? If the Gabriel & Co. engagement setting that you purchased from J.R. Dunn Jewelers was in-stock in the showroom and you purchased the center stone from us as well, we would extend our 30-day-from-date-of-purchase return policy on the piece. + Does Gabriel & Co. have a trade-up policy? - Does Gabriel & Co. have a trade-up policy? If you purchased the center stone for your Gabriel & Co. engagement setting from J.R. Dunn, you can use the full value of the purchase price to use on an in-stock diamond with a purchase price of at least 50 percent more. The original sales receipt(s) and a lab report must be provided with the request, and your diamond must be in like-new condition to be considered for the trade-up program.